At Dig-In we stand by our motto ‘happiness is healthy’. Being around a happy dog is infectious and despite whatever kind of day you’ve had your troubles melt away. There are few joys in life that match being greeted by your best friend tail wagging, excited panting and even smiling. But what about after they’ve settled down? Is your best friend still happy? 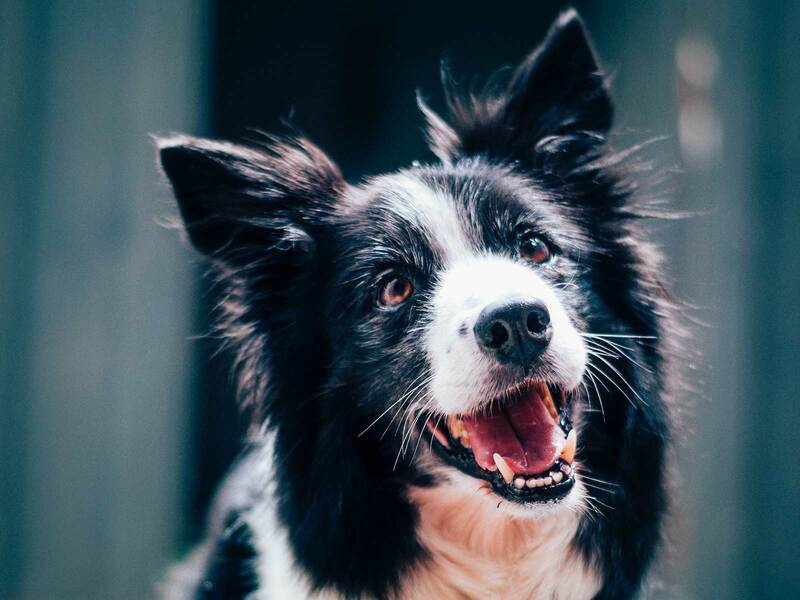 As you are no doubt aware doggie language is almost exclusively physically, so we thought we’d let you in on some of that language, so you can see if your dog is a happy one. Eyes, face and Ears are Relaxed – Like their human counterparts, you can tell an emotional state by looking at the face. A happy dog’s eyes’ blink a lot, the brow, ears and eyelids are relaxed. The ears especially can be a dead giveaway, they should be in a relaxed position, neither downward in submission or shifting in alertness. Looking at a happy dogs face you’ll notice a soft gaze with an open mouth, the tongue is either lolling or smiling and teeth aren’t bared. Posture is Positive – Happy dogs have a neutral posture usually with all four paws on the ground and weight evenly distributed. There’s no tension in the body and the tail is wagging either gently or even erratically depending on what’s afoot. Lean on me – Ever wondered why your dog will just mosey on over and then sit on your foot or straight up leans on you? This is the equivalent of a dog hug, dogs lean on their people for a number of reason’s but in almost all circumstances, it is because they look to you for comfort and affection. Happiness for your dog is knowing they’ve got someone to lean on. Belly and paws up – A happy dog is without a doubt a relaxed dog. The belly up with paws floating in the air position is about as relaxed as your four-legged buddy will get. This body language indicates that they are not concerned with anything at all and is often accompanied by a back scratching wiggle. 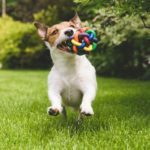 Playtime, ready when you are – Happy dogs have the energy to spare and are always up for a play, walk, a game of fetch or crazy five minutes when you are. Dogs approach play a number of ways from bringing you their favourite toy to launching straight into a play bow. Keen watchers of our routine dogs know when a walk, drive or play time might be about to happen and will throw their enthusiasm behind doing any activity with you. High Pitched Stutter Bark – Not all dogs are barkers and for some owners, the only peep they hear from dogs is a high pitched yap. This is usually a vocalisation of pure joy and a signal that ‘Hey, I’m ready to play, you keen?’. 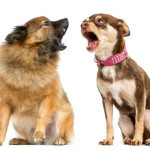 There’s a whole language behind dogs barking and if you are fascinated by your dog’s barks and what they mean, you should read this article. But if you are having difficulty with a barking dog – this article may be of help – here. Tail Position and Movement – Dogs tails are big indicators of emotions. There’s a lot of sentences happening back there from ‘I’m being submissive and will do whatever takes to please you’ through to ‘You need to back off. Now!’ A happy dogs tail is usually wagging. But not all wags are created equally. Tails wags can mean different things depending on which way the tail is wagging and the elevation of the tail is a big one too – you can read more here. As a general rule, a higher the tail position and broad wag the dogs is confident and happy. A lower tail but still broad is a sign of approaching in a friendly manner and being submissive if the tail is really low and wagging its kind of asking to bury the hatchet. 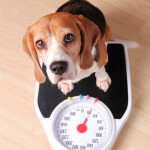 Good Health and Appetite – Happiness is healthy and being healthy is a key component to your dog’s happiness. Your dog should look forward to meal times and the bowl is licked clean after each meal. 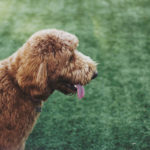 Digestion and gut health also plays an essential role in health, we’ve written a plethora of articles of on how to improve Dog Gut Health (it’s kind of what we offer). There are of course other signs of dog health, alert & bright eyes, healthy coat and plenty of energy all of which Dig-In will assist with. Without a doubt, dogs are meant to be happy. If you’re seeing the above signs exhibited by your best mate then your dogs is certainly a happy friend. Like always if you’re unsure feel free to drop us a line and remember ‘Happiness is healthy’.